It didn't seem likely the Toy Story franchise could top itself after the last installment, but Pixar is looking to do just that next year with Toy Story 4. Of course, we can expect to see all the lead voice actors reprising their roles, such as Tom Hanks as Woody and Tim Allen as Buzz Lightyear. However, there will definitely be some new toys in the mix as well, opening the door to bring in some interesting vocal talent. Allen let it slip on The Tonight Show last month that actor Keanu Reeves has a voice role in the movie, playing an unspecified character. Recently, Keanu Reeves himself confirmed his part in the movie, and explained how this odd casting choice came to be. "I got a call which was really cool out the blue from the lovely people at Pixar and the creators of this number, this edition, or continuation of the story. They pitched the character to me and then we spoke and they allowed me to kind of riff on it." Of course, Reeves didn't divulge any major details about his role, such as a name or description of the character. Given his involvement in action movies in recent years, it seems probably the John Wick star will be playing a serious character, possibly as a foil to the heroes. Anything can happen, however, as longtime fans will remember how Reeves can shine in his comedic roles as well, dating back to the Bill and Ted movies. With tentative plans to reunite with Alex Winter for a third movie in that franchise, it's clear Reeves is not opposed to taking on goofy characters either. In any case, this will be the actor's first role in a big-studio animated movie, so hopefully it's a good one. Directed by Josh Cooley, the new sequel picks up after the events of Toy Story 3. As well as the mystery toy played by Reeves, Toy Story 4 will also see other new additions to the cast, including Tony Hale, Keegan-Michael Key, and Jordan Peele. Joining Hanks and Allen in reprising their roles are several other returning actors, such as Joan Cusack, Annie Potts, and Wallace Shawn. Hanks and Allen have teased that the movie will have a very emotional ending, and it's clear Disney and Pixar are hoping for the same success achieved by the previous three installments. As for Reeves, Toy Story 4 is far from the only movie he'll be appearing in next year. His newest movie Replicas, a sci-fi thriller from director Nachmanoff, will be releasing in January. The highly-anticipated action sequel John Wick 3 will also be arriving in May, letting Reeves reprise one of his most popular roles. By the time June rolls around, the actor will be fresh in the minds of moviegoers, making the role in Toy Story 4 all the more enjoyable. 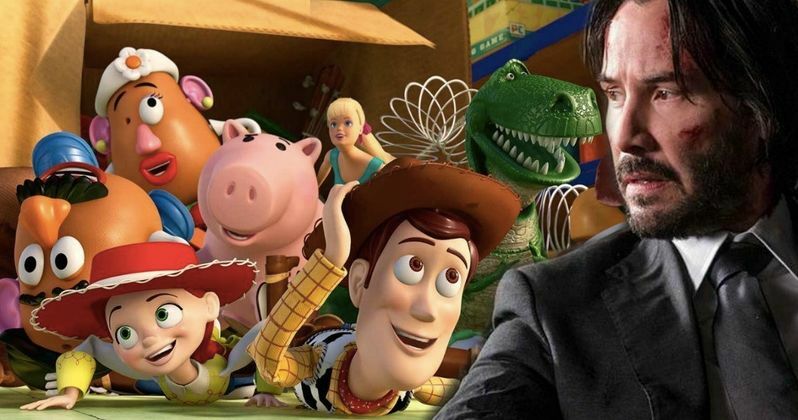 To see what the role for Reeves in Toy Story 4 turns out to be, we'll have to watch the movie. Toy Story 4 will be released in theaters everywhere on June 21, 2019. This information comes to us from Collider.